My sister, Jessica and I came out of our rooms at the beach last week, and we were basically wearing the same outfit for dinner that night. Hah!! 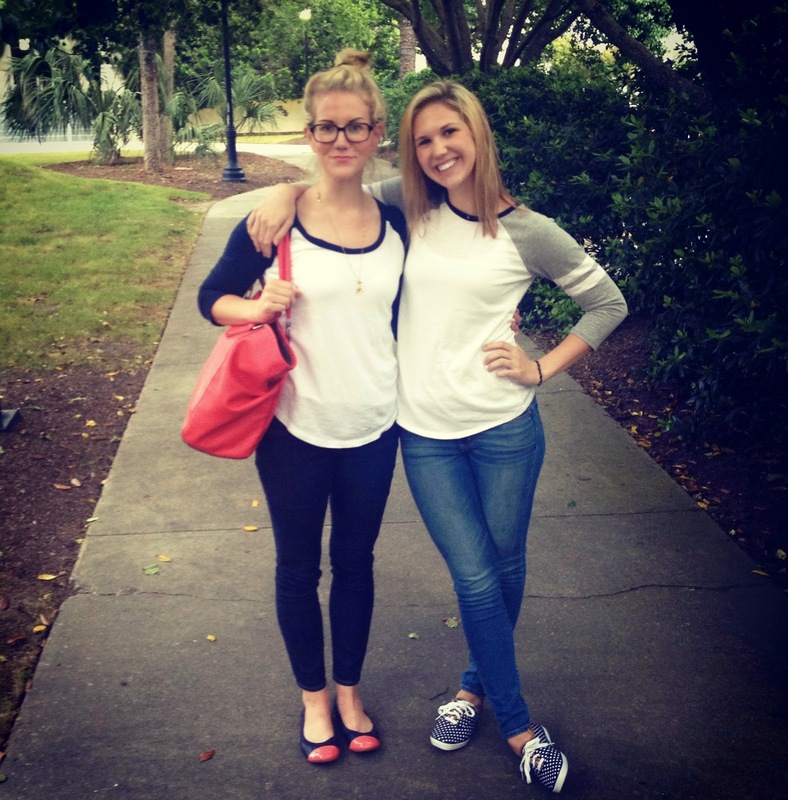 We've both been loving our baseball tees lately....so cozy, so fun, and pretty cute! I do like this tee with a casual outfit, but I've also styled it with a dressy outfit as well. I like it (!) and I'll show you soon. I've said it before and I'll say it again -- cutest sisters!!!!!! :) I need to find myself a solid baseball tee, they are so comfy! Very cute! I love a really casual look! So cool! So cute!! And I love your bag! So cute! I love a good baseball tee! They're so adorable and comfy and easy to dress up or down! There is nothing wrong with Beach Haze pictures! Love the baseball tee! You two are the cutest in your baseball tees! So cute!! I really need a baseball T.
my grey and white baseball t is a staple. love urs! xO! You two are so, so sweet! I love your flats! You two are adorable! Can't wait to see how else you style the shirt. I love baseball tees! You both look great! I do love a good baseball tee! My sister and I are way different on the style spectrum but I love that you two are so alike! How cute are you, two?! I don't have a baseball tee right now and I REALLY want one! I LOVE the shirts. And that you didn't plan on dressing alike. I think I need to get me a baseball tee.